8x8 Y click is a 64 LED matrix display Click board™, composed of SMD LEDs organized in 8 rows by 8 columns. 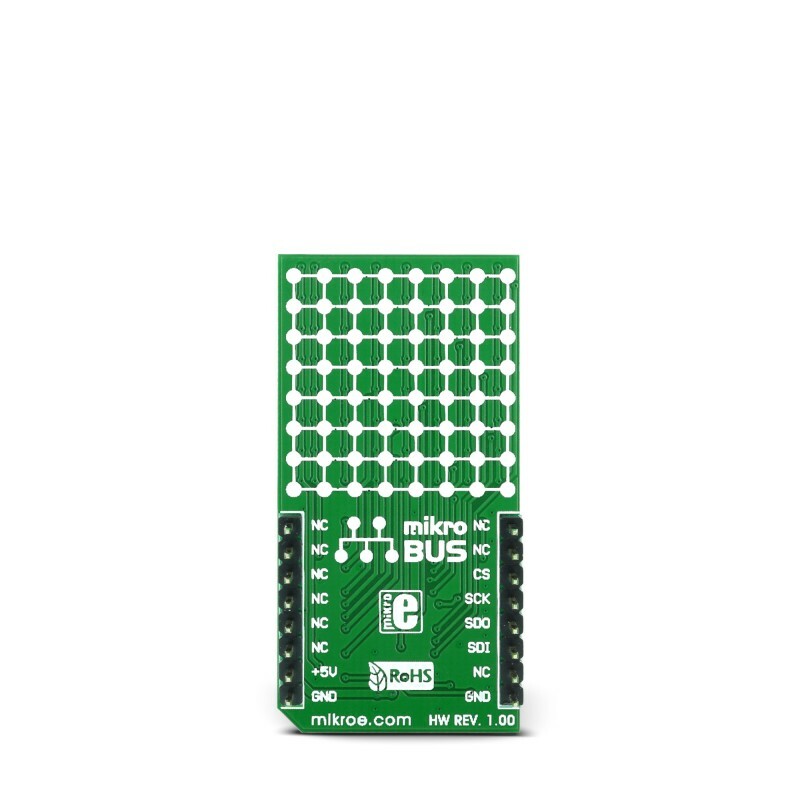 It has a digital brightness control in 16 steps, it can control every LED in the display matrix independently, it blanks the display on power up to eliminate glitches and it requires a single resistor to control the current through all the LEDs at once, which simplifies the design. 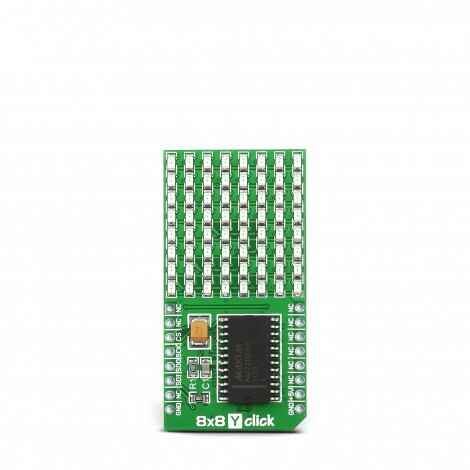 8x8 click uses a fast SPI communication protocol, allowing fast display response and no lag. 8x8 Y click can be used as a display or signalization output for a range of applications that are designed to display various information or graphics on the matrix LED display. 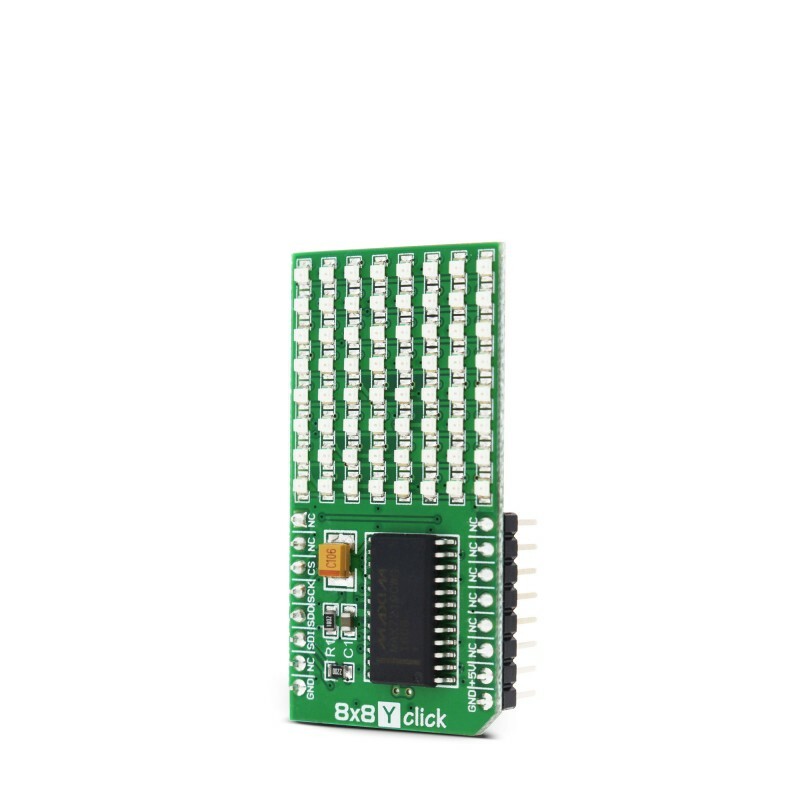 By using functions provided by MikroElektronika, it is possible to make a text scroller in a very simple way, greatly expanding the functionality of the 8x8 click. The main active component of the 8x8 click is the MAX7129, a serially interfaced, a common cathode 8-digit LED display driver from Maxim Integrated. It consists of 8x8 RAM cells for storing the digit data, 16bit data shifter, constant current source for the LED segments, address register decoder, the intensity pulse width modulator, the digit scan section and finally output LED drivers. This IC is primarily designed to drive eight 7-segment LED digits with an additional dot segment (8 digits by 8 segments), but it can be used to drive a set of similar types of displays, such as LED matrices (e.g. 8x8 click), bar graph displays, panel meters, and similar. For that reason, the output drivers are referred to as digit outputs and segment outputs. This categorization also mirrors the way the internal memory is organized. The scan rate of the LED matrix display is 800Hz, typically. The input data is clocked in as described above, in a form of 16bit packets. Those packets contain the command and the data, both interleaved inside the packet. The first 8 bits are the data bits (D0 to D7), while the next four bits contain the register address (D8 to D11). The last four bits are disregarded by the internal logic (D12 to D15). The data is clocked MSB first, so the first received bit would be D15. 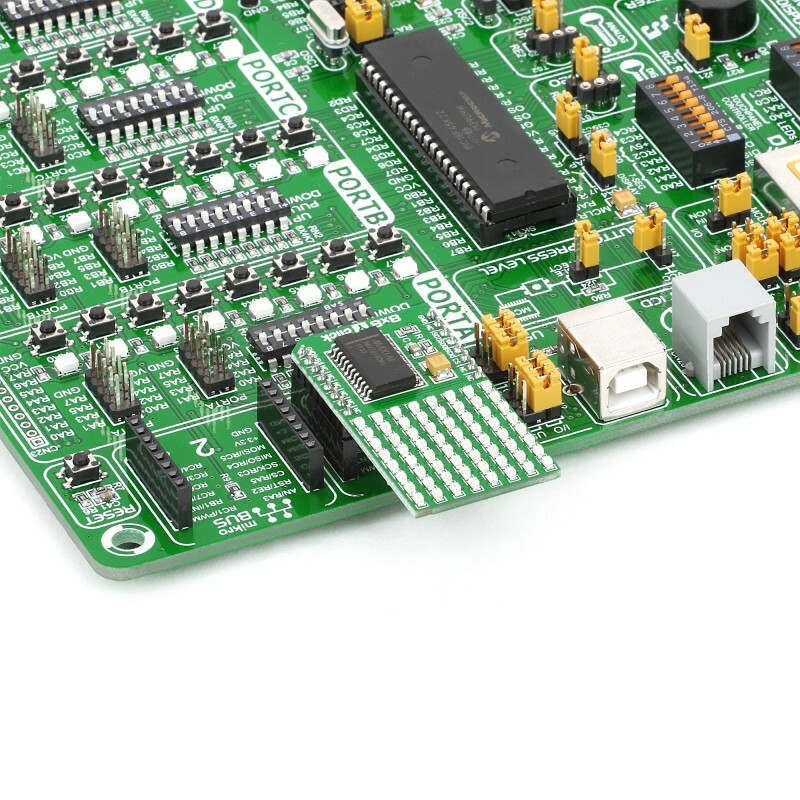 There is a number of various registers embedded in the MAX7129 IC that are used to perform a range of different functions. It has registers to set modes for each digit, setting it to binary coded decimal format (BCD) or no coding at all. It has a scan limit register, which limits display scanning to an arbitrary number of digits, test register which sets all the segments on all the digits to be fully ON, registers that allow intensity control by changing the duty cycle of the PWM, and so on. 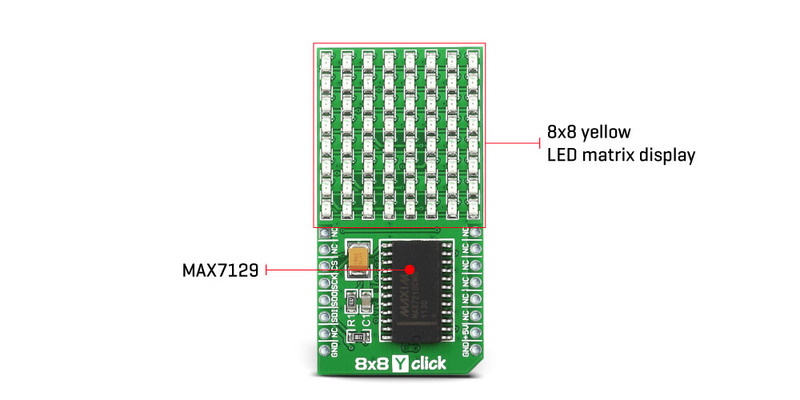 It should be noted that some of the registers make sense only if used with 7-segment LED elements, so their use should be avoided completely in the code, as the 8x8 click board is designed as a matrix LED display. More information about the registers and their usage can be found in the MAX7129 datasheet. Using functions provided by MikroElektronika ensures that the correct registers are accessed and exposes a comprehensive set of commands to work with the 8x8 Y click. An onboard resistor sets the peak current through the segments. This current is fine-tuned according to used LEDs requirements. The brightness can be changed by writing data in the intensity register. The lower 4 nibbles of this register are used to control the internal PWM duty cycle, allowing brightness control in 16 steps. This intensity register affects the global brightness, so it is used to dim the entire display at once. This table shows how the pinout on 8x8 Y click corresponds to the pinout on the mikroBUS™ socket (the latter shown in the two middle columns). We provide a library for 8x8 Y click on our LibStock page, as well as a demo application (example), developed using MikroElektronika compilers and mikroSDK. The provided click library is mikroSDK standard compliant. The demo application can run on all the main MikroElektronika development boards. The library provides generic functions for controlling the Click board™. void c8x8y_writeReg(uint8_t Reg, uint8_t Value); - Function for writing data to a register. void c8x8y_writeText(uint8_t *pStr, uint8_t nLenght); - Scrolls provided text. 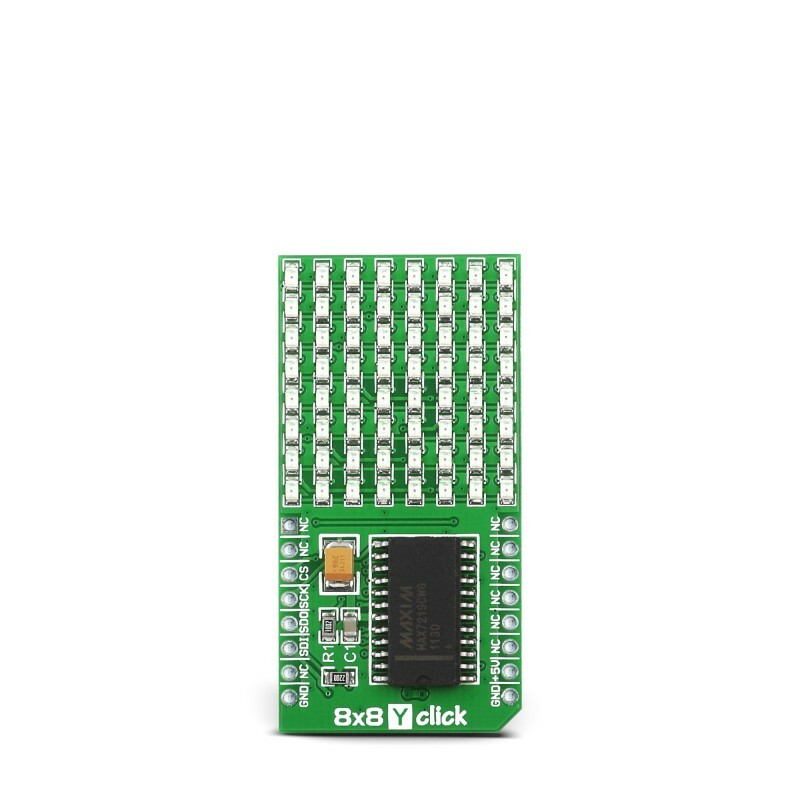 Application Initialization - Driver initialization and default configuration of the 8x8 click board. Application Task - (code snippet) - Sequential writing of provided string each one second.